HughesNet is a solid satellite internet choice for a lot of rural customers across the country. If you don’t plan on streaming tons of video or gaming heavily, HughesNet has multiple plans to offer starting at $49.99 a month. If you lease your equipment there aren’t any upfront fees either. The new Gen5 service is faster than most satellite internet services (with every level of plan) and offers fairly reliable service. Available anywhere in the US, even rural locations. HughesNet’s newest technology, Gen5, offers download speeds of 25 Mbps and upload speeds of 3 Mbps. This is true no matter which plan you choose or where you live, which makes HughesNet a better choice than competing satellite provider Viasat (formerly Exede) for many areas. Depending on your location, there are up to 4 plans available. Every plan includes many of the features that make HughesNet a viable option: a 2 year price guarantee, built in WiFi and no hard data limits. The only difference between the 4 plans is the amount of data you’ll be able to use every month without your speeds decreasing. You can choose from 10, 20, 30 and 50 GB plans, although not every package is available in every location. Plans range from $49.99 to $99.99 per month for the first 24 months, with non-promotion pricing currently $49.99 to $129.99 a month. This is on par with comparable plans from other rural providers like Viasat. For most families, $50/mo. for internet is not unreasonable, but this will only get you 10 GB of data. Increasing your data limit increases your monthly bill quickly. Like all satellite internet, HughesNet has its downsides, and many homes should turn first to fiber, cable or DSL options. For rural families without access to wired internet options, HughesNet offers a high speed connection that works for email, online banking and shopping, social media, some streaming and other moderate internet use. HughesNet currently advertises “unlimited” satellite internet. What this means is that for the first 10 to 50 GB of your plan (this is determined by whichever plan you choose), you’ll enjoy download speeds of 25 Mbps. After hitting your data limit, your service will be available at reduced speeds, which HughesNet says will top out at 3 Mbps. While this is pretty slow for doing anything other than reading emails, it’s much better than no service or high overage charges. If you’re familiar with Verizon Wireless’s Safety Mode, this is a very similar concept. Like Verizon and other wireless providers, you can also pay for additional high speed data in the form of Data Tokens. You can purchase Data Tokens in 3, 5, 10 and 25 GB allotments for $3 per GB. HughesNet offers the HT2000W Wi-Fi Modem Router with all of its plans for $9.99 per month lease fee for your first 2 years. This includes both your modem and router functionality, which is how HughesNet claims “built in WiFi” with its internet packages. The HughesNet HT2000W Wi-Fi Modem Router offers industry-standard performance, with 2.4 GHz and 5 GHz networks, and 802.11ac WiFi. You can track data usage by individual device and set up a separate WiFi point for your guests. You can also choose to buy your modem/router combination outright when you start your HughesNet service. Instead of paying $9.99 per month ($239.76 over the life of your contract), you’ll have to fork over $249.99 up front. 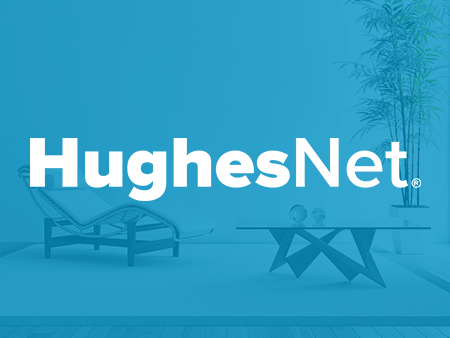 If you’re planning to stay with HughesNet only for the life of your contract, definitely choose the lease option. However, if you’re thinking about sticking with HughesNet for the long haul, buying your equipment outright can lead to big savings down the road. This is especially true because after 2 years, the price of your modem router lease increases to $14.99 a month. In your third year, you’ll save about $170 on equipment if you choose the purchase option. Satellite internet means a satellite dish, which is also part of your HughesNet package. Your dish is included in your lease or purchase cost along with your modem router. In order to use HughesNet the dish needs to have an unobstructed view of the southern sky. An installer also needs to be able to reach the point on your roof (or another point 4+ feet off the ground) where you’d like the dish installed. The HughesNet Router is installed and set up by the certified installer. HughesNet is not very upfront about the added features of their internet plans. Many are not clearly explained, even in the disclaimers section of their website (which is plenty long). There are definitely some added benefits that we think HughesNet could talk more about. $100 instant savings applies to new residential subscribers who purchase a new HughesNet system. Not applicable with the Lease option. $99 instant savings applies to new residential subscribers who lease a new HughesNet system. Not applicable with the Purchase option. What this means is that if you lease your equipment, you pay $9.99 per month, get free installation and your lease set-up fee is covered by the $99 instant savings mentioned above. If you choose to purchase your HughesNet equipment, there is no $99 lease set up fee and the $199.99 installation charge is now $99.99 after the $100 instant savings. You’ll pay $349.98 upfront with the purchase option for equipment and installation, but never pay an equipment fee again. Okay, so data isn’t really “unlimited,” even if HughesNet says it is. What this really means is that once you hit your data limit, your service is slowed down instead of stopped completely. You won’t be able to do much more than check email or visit basic websites (and even that is going to be pretty slow). However, some internet is definitely better than no internet and you won’t be hit with fees for going over your plan. All of HughesNet’s plans include 50 GB of 25 Mbps high speed “Bonus Zone Data.” This is additional data, above and beyond your monthly data allowance, that can be used from 2 am to 8 am every day. This is slightly different from Viasat’s “Free Zone,” which allows unlimited data usage at your normal speeds from 3 am to 6 am. With Bonus Zone Data, you can schedule downloads (like large documents and videos), software updates and data backups. Like most internet providers, you can set up emails accounts through HughesNet. You’re allowed up to 10 accounts with 10 GB of storage each with the ability to send and receive attachments up to 25 MB. HughesNet plans include data limits, so conserving data is important. One way HughesNet helps you do this is enabling Data Saving Mode. This reduces the quality that your video streams at from HD to DVD quality. Most people won’t notice a difference in the image and you’ll save a lot of data over the course of each month. When you subscribe to HughesNet you can choose to add Express Repair service to your plan. There are two levels of service: Basic (which guarantees a technician will service your system within 2 business days of you reporting an issue) and Premium (which offers next-day technical service). Express Repair covers most issues with your HughesNet equipment and the cost of parts required to restore service. There are also a number of items that aren’t covered under Express Repair, like damaged equipment (including from natural disasters), antenna relocation, changing mounting hardware, software upgrades and a few other situations. When you subscribe to Express Repair, you pay $99 for onsite visits your first 30 days of service and $29.95 for service after 30 days. This is in addition to the monthly fee of $7.95/mo. for Basic and $11.95/mo. for Premium. Your first month of service is free, so it doesn’t hurt to add it when you buy and then drop it from your plan. HughesNet’s customer service seems to be hit-or-miss. Some customers report helpful customer service agents and timely technicians. Others, however, said they have been purposely ignored and outright lied to. One theme among customer complaints is ignored emails. A call may yield better results if you have an issue yourself with HughesNet and there is also chat support available. We experienced average service with HughesNet’s 24/7 customer support; no TV or internet company can claim a great customer experience. One factor that can potentially affect your customer service is the installers and technicians in your area. HughesNet contracts out its service to third-party companies, which means quality can vary widely depending on where you live. HughesNet offers a couple of tools to change your plan settings without speaking to a customer service agent. The myHughesNet website is available to pay your bill, see usage notifications and change your plan. You can also use their app or the Usage Meter to make changes to your account settings. There is no 1 way to save money on equipment. If you plan to only stay with HughesNet for 2 years, leasing the modem router and other equipment will be more cost-effective. For homes planning on keeping HughesNet for 25+ months, buying equipment outright is less expensive over time. HughesNet offers the ability to change your internet plan during your contract. If you signed up for the smallest package and constantly find yourself spending more than $10 a month on Data Tokens, it’s worth upgrading to the 20 GB plan. If you never hit your data cap, consider downgrading to save! While this is not strictly a way to save money on your HughesNet plan, make sure to return your HughesNet equipment if you do end your internet service. Failing to return your radio transmitter and modem within 45 days of cancelling will cost you $300. HughesNet Gen5 offers reliable high speed plans with well thought-out features, making it a good option for moderate internet users in rural areas. No plan has a hard data limit, which is a welcome feature for long-time satellite users used to paying an arm and a leg any time they use just a little bit too much data. There is an antenna that needs to be attached to your home or another stationary structure with a clear view of the Southern sky, which isn’t always an option. Customer service quality leaves something to be desired as well. Overall, we think even past HughesNet customers who didn’t enjoy previous HughesNet service should give Gen5 a chance! With plans that start at $49.99 a month for a full 10 GB of data at 25 Mbps download speeds, as well as other reasonable plans, it’s worth choosing HughesNet for internet service. I have been your customer since 2012. Satellite was my only option at that time and you were allegedly the “best”… and slow internet was better than none at all. I was an early adopter of Gen 5 immediately after the launch of EchoStar XIXI, and that was awesome…temporarily. Initially, before everyone else jumped on, the speeds were fast and consistent. Unfortunately that is no longer the case. Now your speeds fluctuate wildly and streaming video annoying and nearly impossible. More troubling are the slow page load speeds for normal websites. I have wasted countless hours on the phone with your outsourced tech support who are coached to blame the problem on the weather (or anything except too many customers on line). I feel so sorry for them. Forced to interact with your angry and disappointed customers, they patiently put up with all the hostility that is meant to be directed at you. What a horrible way to earn a living. By the way… please give them all a raise. They deserve it. I’m escalated to your upper tier tech support on a regular basis, but they can’t seem to find or fix the problem either. (at least they don’t try and blame the weather) I have had you out to my house on numerous occasions to troubleshoot, but you never find any problem here. Its not my dish’s view of the sky, nor it’s signal strength. It’s not my cable connections, nor the any of my hardware. It's you… not me. I believe that you have, yet again, oversold your bandwidth. Too many people using your network all at once. Whatever the REAL cause, your service has been and continues to be slow, erratic and undependable. I pay in excess of $1800 a year for service that is no better than dial-up…. and often much much worse.